We’d love your help. Let us know what’s wrong with this preview of The Man With a Load of Mischief by Martha Grimes. To ask other readers questions about The Man With a Load of Mischief, please sign up. What actor would portray Richard Jury? 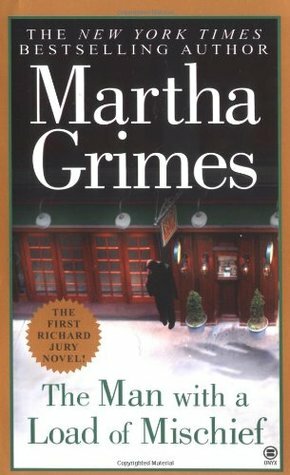 Look, I am not going to apologize for loving Martha Grimes, especially the Richard Jury novels. I am fully willing to admit these are light reading, but that doesn't mean they aren't good. I find that while Grimes continues writing for this series and pumps out a book a year, the cast of characters is still just damned entertaining. Grimes is good at capturing the same wit that I see in British comedy even though she's an American. However, and this is a big caveat, don't look for realism here. A Look, I am not going to apologize for loving Martha Grimes, especially the Richard Jury novels. I am fully willing to admit these are light reading, but that doesn't mean they aren't good. However, and this is a big caveat, don't look for realism here. Although each novel may seem to take place within current events, it's clear that Grimes' England is not meant to be true to the times. Richard Jury has also lived remarkably long and is still quite well preserved considering his age if you do the math. I urge you not to do the math. The charm in these novels is the characters, the more tangential to the actual mystery the better. There's Marshall Trueblood, a bisexual antiques dealer; Vivian Rivington, who is constantly ribbed about her Italian fiance, who is referred to as a vampire; Carole Palutski, a red-headed smoking hot babe who constantly tries to seduce Jury, acts up a storm and works as a fortuneteller in Covent Garden; Wiggins, a police man addicted to natural remedies and always convinced he is ill; Melrose Plant, an earl who has renounced his earlship, but picks it up again constantly to help in investigations; and his horrible aunt Agatha who constantly badgers him, steals his things, and tags along after him like a child left out of the fun. This is only to name a few of the colourful cast. Certainly, they are Dickensian, as I saw one reviewer mention scathingly on Amazon, but that's deliberate. They aren't real people, just as Dickens' casts of characters are a bit over the top, but they're entertaining and it's possible to overlook the fact that Grimes' stories can become somewhat formulaic, especially because in her mystery victims, suspects, witnesses, etc. she is attracted to certain types of characters (clever young children, eccentric animals, beautiful women who Jury is drawn to or who are drawn to him). It's hard to believe I've never read a Richard Jury mystery. But, this is my first, but won't be my last. I loved it. This the first book in the series. Jury is with Scotland Yard. He gets called into a small village after two murders have been committed. Jury makes friends with Melrose Plant, who is a big help in the investigation. I presume Plant will work with Jury again someday. Grimes sets up a great, keeps you guessing, who done it. The author has a great sense of humor as well. I loved the It's hard to believe I've never read a Richard Jury mystery. But, this is my first, but won't be my last. I loved it. Grimes sets up a great, keeps you guessing, who done it. The author has a great sense of humor as well. I loved the banter between Plant. and his Aunt Agatha. Martha Grimes is American, but writes British mysteries right up there with the heavy hitters. You know you are in the hands of a master when a mystery is simultaneously complex, lyrically-written, character-rich...and hilarious. This was Grimes's first in the Jury series and she went on from strength to strength which, given how much time she must have spent in the pubs for which each book is named, is almost miraculous! In as sense, Grimes mysteries are character studies, and what a cast of regular characters she creates, from thoughtful and handsome Inspector Richard Jury and his hypoc You know you are in the hands of a master when a mystery is simultaneously complex, lyrically-written, character-rich...and hilarious. This was Grimes's first in the Jury series and she went on from strength to strength which, given how much time she must have spent in the pubs for which each book is named, is almost miraculous! In as sense, Grimes mysteries are character studies, and what a cast of regular characters she creates, from thoughtful and handsome Inspector Richard Jury and his hypochondriac sidekick, Sergeant Wiggins, to the rest of the denizens of the village of Long Piddleton (the name alone is a clue) and it's resident toff, Melrose Plant who has relinquished his title as Lord Ardry. Somehow, he becomes Jury's friend, partner in detection, and handy stand in for Jury at key moments. The full range of the quirky characters who hang out at the title pub is too long to mention and indeed they grow as the series continues from this auspicious start. But I am always glad to once again make their acquaintance. Suffice it to say that surprises, and also chuckles, appear on almost every page. I was surprised to learn a new word before reading this. It is me to a tee: "a completionist". It explains how I shop. I click into "collect every kind" mode. Over ten years, I filled in all but "The Man With A Load Of Mischief", 1981. Having started with the loveable Melrose Plant and Richard Jury, I am keen about the next; goodness knowing I own it and expect authors to improve! Series aside, it is why I go in order of release. By the end of this novel, the construction of Martha Grimes' chara I was surprised to learn a new word before reading this. It is me to a tee: "a completionist". It explains how I shop. I click into "collect every kind" mode. Over ten years, I filled in all but "The Man With A Load Of Mischief", 1981. Having started with the loveable Melrose Plant and Richard Jury, I am keen about the next; goodness knowing I own it and expect authors to improve! Series aside, it is why I go in order of release. By the end of this novel, the construction of Martha Grimes' characters pays off. There were hilarious quips I re-read to titter over anew. When Melrose organizes a theatre scene to show how the pinnacle of crimes started, his Aunt Agatha gripes over her short role and I could hear Melrose retorting: "We aren't trying for the Royal Shakespeare Company! Just do your parts"! It is the only quip that surpassed his and his butler's explosion over Agatha's mispronounced names. Martha proved an excellent plotter. All information factored into her mystery. The story is original: three strangers in different pubs. Why kill strangers? The motives fit superbly, filled in plausibly when an old employee is searched out. There are gratifying clues to explore. I have been planning on reading this author for years. I am very glad I finally did. At first I thought it was going to be the Holmes-watson style. The genius amateur detective helps the less brilliant Police Inspector. This was not the case, both men are intelligent and capable. Richard Jury is a fascinating character. You learn quickly he is intelligent and very good at his job. Melrose Plant is a very interesting character, someone who is clever and has all the advantageous anyone could hope fo I have been planning on reading this author for years. I am very glad I finally did. Melrose Plant is a very interesting character, someone who is clever and has all the advantageous anyone could hope for. I think my favorite character's were the comic Wiggins, a hypochondriac, and Lady Ardry who is aggravating to the extreme. The murder, who dispatches five victims, was not hard to figure out, but the wonderful characters and style of writing held one interested to the end. This is the first novel in Martha Grimes’ long-running British police procedural series featuring Richard Jury and Melrose Plant. The book was originally published in 1981 so the reader must realize from the outset that there will be no cell phones, no personal computers, no Internet and no pocket-sized personal cameras to aid in solving the murder. It will be an eyes, ears, brain and door-to-door investigation. And, the author makes more than the identity of the murderer a mystery. First, she giv This is the first novel in Martha Grimes’ long-running British police procedural series featuring Richard Jury and Melrose Plant. The book was originally published in 1981 so the reader must realize from the outset that there will be no cell phones, no personal computers, no Internet and no pocket-sized personal cameras to aid in solving the murder. It will be an eyes, ears, brain and door-to-door investigation. First, she gives us a day and date on which our story begins, but she does not provide us with the year. Based on the structure of the dialog in the first few chapters, this story could be taking place anytime since the turn into the twentieth century. However, she does give us clues to narrow it down and a not-so-quick trip or two through Google helped me out there, a trick that readers back in 1981 could not execute. But, then again, those clues would have been far more familiar to a reader of that time anyway. Secondly, the author describes all the suspects and secondary characters in fine detail but fails to provide us with much of anything in the way of a physical description for our two protagonists. It took the entirety of the first three chapters just to glean that Plant wears gold-rimmed spectacles on a fine nose, is in his early 40’s, has green eyes, is single and is “not terribly handsome, but handsome enough, not terribly tall but tall enough.” And as far as Jury, our main protagonist, is concerned, there is nothing beyond the fact that he is in his early 40’s, single and childless – no hair color, no eye color, no body build, nothing. Thirdly, the author gives us very little backstory for either Plant or Jury. We seem to encounter them in the 40th year of their lives, fully made, with just the barest hints of painful events in each of their pasts. The intimations are presented just often enough to make the reader believe that more will be revealed as the series needs it to be revealed. And fourthly – and most importantly – the author provides our story in the form of dual first person POV’s, those of our two main protagonists, Jury and Plant. If they don’t see it, hear it, read it or think it, we don’t know it. Therefore, we must pay close attention to not only find the clues but to attach them to a suspect. The author’s writing style is descriptive and full but not overly wordy. And, yes, an American reader may need a dictionary at times. The dialog is tailored to fit each character’s implied personality and ranges from witty to serious to sarcastic to tongue-in-cheek. The internal monologues of Plant are often hilarious and full of double entendre, but fully illustrate his intelligence and comprehension. And Jury’s internal monologues are filled not only with logic but perception and compassion. The author has created DCI Richard Jury as an honest, hard-working CID detective with good insight into the machinations of human nature, work place politics, and command dynamics. She has created a believable character who should be a delight to follow into further mysteries, particularly as she adds Melrose Plant in again as his unofficial investigative partner. Chief Inspector Jury of Scotland Yard has been assigned to a case in the town of Long Piddleton, where two murders are being investigated. Both bodies have been discovered in local pubs, The Man with a Load of Mischief and The Jack and Hammer. During the course of his investigation, Jury is accompanied by his hypondriac Sgt. Wiggins, more bodies are discovered. Jury's investigation introduces an intriguing cast of witnesses / suspects; from wealthy Melrose Plant, his precocious aunt Lady Agatha, antique dealer Marshall Trueblood, lovely poetess Vivian Rivington, and many others. I particularly enjoyed Jury's interactions with the Double children; they added a nice gentle touch to this murder mystery. The Man With a Load of Mischief is book one in The Richard Jury Mysteries. Scotland Yard Inspector Detective Chief Inspector Richard Jury was called to help find the murder of two men in a small English village called Long Piddleton. However, everyone in Long Piddleton except Melrose Plant was looking for the killer outside the town. With the help of Melrose Plant Detective Chief Inspector Richard Jury started to investigate. The readers will continue to follow Melrose Plant and Detective Chief The Man With a Load of Mischief is book one in The Richard Jury Mysteries. Scotland Yard Inspector Detective Chief Inspector Richard Jury was called to help find the murder of two men in a small English village called Long Piddleton. However, everyone in Long Piddleton except Melrose Plant was looking for the killer outside the town. With the help of Melrose Plant Detective Chief Inspector Richard Jury started to investigate. The readers will continue to follow Melrose Plant and Detective Chief Inspector Richard Jury investigation into the death of the two men. The Man With a Load of Mischief is the first book I have read of Martha Grimes, and I enjoyed it. I love Martha Grimes portrayal her characters and the way they interact with each other. Martha Grimes does a fantastic job of describing her sittings that allow me to image setting in the gardens of Jack and Hammer having a beer. The Man With a Load of Mischief is well written and researched by Martha Grimes. The readers of The Man With a Load of Mischief will learn about living in a small English village. Also, the readers of The Man With a Load of Mischief will start to understand the role of Scotland Yard in law enforcement investigation. I've decided to give myself a treat with my summer reading by indulging mostly in my guilty pleasures - that is to say mysteries. And in so doing, I plan to delve into some of the series which I haven't sampled before, starting with Martha Grimes' Inspector Richard Jury series. This has been recommended to me at various times over the years, but, for some reason, I just never got into it. Maybe because I was busy reading several other series. But time to break new ground and meet some new charact I've decided to give myself a treat with my summer reading by indulging mostly in my guilty pleasures - that is to say mysteries. And in so doing, I plan to delve into some of the series which I haven't sampled before, starting with Martha Grimes' Inspector Richard Jury series. This has been recommended to me at various times over the years, but, for some reason, I just never got into it. Maybe because I was busy reading several other series. But time to break new ground and meet some new characters. One would think that a book featuring a New Scotland Yard detective inspector as its main character would be a police procedural type, but this, I think, falls more in the "cozy" category. While Inspector Jury may be the main character, the story is set in a small village and there are various eccentric villagers who "assist the police in their inquiries," and we see much of the story through their eyes. The village is Long Piddleton - Long Pidd to the locals. It is a quaint little place that has recently been discovered by Londoners seeking a refuge from the hurly burly of city life. It is a village where nothing of note ever happens. And then the murders start. First, the body of a stranger to the village is found with his head stuck in a barrel of beer in the cellar of one of the village pubs. But before he was put in the barrel, he was strangled with a wire. This all happened while the pub was busy with patrons, but nobody saw a thing. Within twenty-four hours, another body is found at another village pub - this one stuck on a beam over the pub's name sign. And then the whole thing just gets silly. People are dropping like flies and there are few clues to indicate what is going on. The thing is that all of the victims at first are supposedly unknown to the villagers and seem to have no connection to Long Pidd. But Jury is quite sure that there must be a connection if only he can find it. One of Long Piddleton's own, Melrose Plant, a former lord who gave up his title, then finds another dead body. But this one breaks the pattern. It is a local girl, maid to the vicar, who had recently left town (she said) to visit her family. Plant becomes fascinated by the murders and turns into an amateur sleuth, helping Inspector Jury root out the source of evil in his village. Comic relief is provided by Plant's overbearing Aunt Agatha who fancies herself a modern-day Miss Marple. In fact, one of the most fun things about this book was its gentle humor. Several of the characters are quirky to the point of peculiarity and they provide a lot of leavening for this essentially straightforward tale of greed gone wild. I found The Man with a Load of Mischief to be a very light and pleasant read, almost perfect for a summer day. True, the last 15% or so of the book began to drag just a bit, after Jury had already solved the mystery and the culprit had been arrested, but, overall, I enjoyed it and I'm moving on to the second entry in the series. There are twenty-three Inspector Richard Jury books in total and I expect to continue reading my way through them in coming months and years. Fun times ahead! This is a rare occasion where I wish there were half stars. I would rate this one a solid 4 1/2. I first became acquainted with the Richard Jury series a few years ago when I happened to read what were then the latest two books in the series. (The Old Wine Shades, and Dust). I believe at least three books came out after those two - but I decided at long last to go all the way back to the first book in the series if I could find it. I am glad I did! I love Martha Grimes' writing style. She presents This is a rare occasion where I wish there were half stars. I would rate this one a solid 4 1/2. 4.5 stars. This is first in series of well over 20 books. Richard Jury is an amiable and intelligent detective who must put up with inferior superiors. He's sent to a small village with clever pub signs to solve murders that keep growing in number until he solves them. He's added by an eccentric and brilliant self-renounced lord Melrose Plant who is plagued by his insufferable aunt who meddles and creates more than a small amount of annoyance to the characters and the reader. You just want to pu 4.5 stars. This is first in series of well over 20 books. Richard Jury is an amiable and intelligent detective who must put up with inferior superiors. He's sent to a small village with clever pub signs to solve murders that keep growing in number until he solves them. He's added by an eccentric and brilliant self-renounced lord Melrose Plant who is plagued by his insufferable aunt who meddles and creates more than a small amount of annoyance to the characters and the reader. You just want to push her over into a ditch before you've even got a third of the way through the book! Discommodious indeed! It's small town life at its murderous best. I don't even know where to start, Im so excited about this series! I listened to it on audio, and I have to say the first 2 hours were rough, though I;m not sure why. There was a lot to follow at the beginning, and I think I was afraid it was going to be full of descriptions of characters I didn't know if I should be caring about or not. Somewhere right after the 2 hour mark the action picked up and I was hooked from there. I also think the narration took some getting use to. Though Steve West i I don't even know where to start, Im so excited about this series! I listened to it on audio, and I have to say the first 2 hours were rough, though I;m not sure why. There was a lot to follow at the beginning, and I think I was afraid it was going to be full of descriptions of characters I didn't know if I should be caring about or not. Somewhere right after the 2 hour mark the action picked up and I was hooked from there. I also think the narration took some getting use to. Though Steve West is incredible at performing really unique voices for each character (and there are tons), his regular narrating voice felt a bit stiff and flat for the first half of the book. I don't know if he found his groove or if I just got use to him, but it all came together rather well by that point! Martha Grimes is now one of my new favorites and I'm so excited to have a new series to follow. The story was incredibly detailed and creative without being boring. I was hanging on every word instead of trying to force myself to follow along. Also, I loved the mystery being solved about an hour before the book was over, which left time to explain things and follow up with some of the main characters. I hate stories where everything is thrown at you the last 10 minutes and you're then left stunned with your mouth open in confusion. A Christmas themed murder mystery. I've heard of Martha Grimes for ages and finally decided to give her a try. I was not disappointed. She had created a smart, somewhat sarcastic, Inspector I am goiyto enjoy following. There were a number of red herrings and unlikeable characters but Jury's sergeant grew into his role and he developed an intriguing relationship/friendship with a local aristocrat that is promising for good detection. This is the 1st time I've ever read this author and so far, I am confident that it will not be the last time. I'm sure to finish this entire series if this first in the series is any indication of crisp writing and engaging characters. I must add that the audio version of this story is great too. The narrator Steve West has an amazing resonant, baritone voice. His reading is fantastic! The name "Fiona Clingmore" made me chuckle. Here is a funny description of her - Fiona Clingmore entered and get This is the 1st time I've ever read this author and so far, I am confident that it will not be the last time. I'm sure to finish this entire series if this first in the series is any indication of crisp writing and engaging characters. I must add that the audio version of this story is great too. The narrator Steve West has an amazing resonant, baritone voice. His reading is fantastic! The name "Fiona Clingmore" made me chuckle. Here is a funny description of her - Fiona Clingmore entered and getting her priorities straight, smiled warmly at Jury before handing over the manila folder to Racer. She was wearing one of those 1940 outfits she seemed to like: black, high-heeled shoes with a button strap across the instep, tight black skirt, black nylon blouse with long, full sleeves which always made her look en negligee. As usual, her neckline was down and her skirt was up. Fiona always seemed to wear her clothes at half-mast; perhaps she was mourning chastity thought Jury. I am loving the cheekiness - "Melrose!" It was his aunt's voice from the saloon bar. "Will you be forever mooning about the dining-room door? Come along, come along!" Should he have answered "Yes, Auntie" and skipped along with his stick and ball? I see she has a new book out in August 2019. Hooray! I love this author so much, and am beholden to her because after reading her books, I wanted to write something similar. The first in the Richard Jury mystery series, beloved by my niece and her Mom. And I see why! Everything I love in a mystery: A quirky/interesting protagonist (Inspector, Detective, Commissario, amateur sleuth, etc. ), an assistant or two, a civilian side-kick who helps solve the mysteries, a superior who is superfluous/annoying, a wonderful cast of characters who add to the dynamics, humor, romantic/sexual tension, a place that is equally a character, crazy names (places and people) etc. This on The first in the Richard Jury mystery series, beloved by my niece and her Mom. And I see why! Everything I love in a mystery: A quirky/interesting protagonist (Inspector, Detective, Commissario, amateur sleuth, etc. ), an assistant or two, a civilian side-kick who helps solve the mysteries, a superior who is superfluous/annoying, a wonderful cast of characters who add to the dynamics, humor, romantic/sexual tension, a place that is equally a character, crazy names (places and people) etc. This one takes place in Long Piddleton (Long Pid, say the natives) in the shires. Jury is called out for two murders, but the bodies keep piling up! The story just happens to take place over Christmas - a coincidence, but given the time of year it added to the enjoyment. These, like a few other series I read, are of the lighter, more genteel sort, which provide nice break from the more grim/gruesome mysteries that are so prevalent these days. I also read those, but they can be exhausting! There was a lot of description of the village, the people, etc. that was hard to keep track of - too much detail! I'm assuming this is designed to set up the series and hope the detailed descriptions will diminish with time. I understand that most of the cast are recurring throughout the series which I am excited to read. Better get cracking - there are 23 Richard Jury books! I listened to this and at first was put off by the narrator, Steve West, but eventually decided he was brilliant at setting the tone and voicing the characters. I really enjoy a good murder mystery from time to time. I don't expect them to be Shakespeare. After all, a murder mystery is, by definition, formulaic. But I do expect reasonably good writing, well-developed characters, and an intriguing storyline to keep me interested in the outcome. "The Man With a Load of Mischief," I am sorry to say, had none of these elements to recommend it. The writing was cliche laden and the characters were downright cartoonish. The whole book This book was not for me. The writing was cliche laden and the characters were downright cartoonish. The whole book felt like a parody of a murder mystery, what with the alibis, red herrings, and English stereotypes. The author also had an annoying habit of referring to the characters by both their first and last names, sometimes in the same paragraph, which made keeping everyone straight very difficult. But the really telling thing is that by the end of this book, I didn't care who the murderer was. I was just glad it was over. I had never heard of Martha Grimes, but a friend gave me a whole box of paperbacks, and I found this book in the pile. British humor, but very clever and easy to get the subtleties. I'm planning on reading more of her books. At the Man with a Load of Mischief, they found the dead body stuck in a keg of beer. At the Jack and Hammer, another body was stuck out on the beam of the pub’s sign, replacing the mechanical man who kept the time. Two pubs. Two murders. One Scotland Yard inspector called in to help. Detective Chief Inspector Richard Jury arrives in Long Piddleton and finds everyone in the postcard village looking outside of town for the killer. Except for one Melrose Plant. A keen observer of human nature, he points Jury in the right direction: into the darkest parts of his neighbors’ hearts. Not a bad book at all but the author sure loves the adjective. It was a really good story and all the unnecessary description didn't make it any better. The plot was different than anything I have ever read... and that fact alone makes the reader want to read "just one more page" until before you know it the "one more page" has turned into the last page. I began reading these mystery novels centered around English pubs in the early 1980s. This is the first Richard Jury, published in 1981, so I decided to spend some time reading this one again to see how it stands up for me after such a long time. I'm glad to say it was every bit as satisfying today as it was then. Martha Grimes gave me so much information regarding the historical meanings of pub signs. I love learning the origins of things such as the pub signs and seeing how they have been chan I began reading these mystery novels centered around English pubs in the early 1980s. This is the first Richard Jury, published in 1981, so I decided to spend some time reading this one again to see how it stands up for me after such a long time. I'm glad to say it was every bit as satisfying today as it was then. Martha Grimes gave me so much information regarding the historical meanings of pub signs. I love learning the origins of things such as the pub signs and seeing how they have been changed through history so that their original meaning is almost gone. Richard Jury is the Scotland Yard man who comes to Long Piddleton to investigate the murders of two men who were strangers in the village but who died in very unusual circumstances at two local pubs. I read this series when it first came out, and for a while a new Grimes in paperback was an automatic buy for me. Then Jury go so depressed and wrapped up in himself I stopped reading them. I haven't revisited them since, so it seemed about time to try one again. The book opens with Melrose Plant, who becomes an important recurring character in the series. Two murders have taken place in local pubs and Plant isn't much interested but his annoying Aunt and all the locals are. Later we meet Richar I read this series when it first came out, and for a while a new Grimes in paperback was an automatic buy for me. Then Jury go so depressed and wrapped up in himself I stopped reading them. I haven't revisited them since, so it seemed about time to try one again. Several months ago, in anticipation of a much-needed weekend off, I asked r/suggestmeabook -- the Reddit page devoted to, you guessed it!, suggesting books -- for a cozy mystery, something that could be read in one sitting, that I'd have a hard time putting down, and something maybe with a cast of characters I'd like to visit with again. I didn't get to it then, but The Man with a Load of Mischief was a suggestion from that conversation that stuck with me, and which I finally got to read this wee Several months ago, in anticipation of a much-needed weekend off, I asked r/suggestmeabook -- the Reddit page devoted to, you guessed it!, suggesting books -- for a cozy mystery, something that could be read in one sitting, that I'd have a hard time putting down, and something maybe with a cast of characters I'd like to visit with again. She was born May 2 in Pittsburgh, Pennsylvania to D.W., a city solicitor, and to June, who owned the Mountain Lake Hotel in Western Maryland where Martha and her brother spent much of their childhood. Grimes earned her B.A. and M.A. at the University of Maryland. She has taught at the University of Iowa, Frostburg State University, and Montg Martha Grimes is an American author of detective fiction.